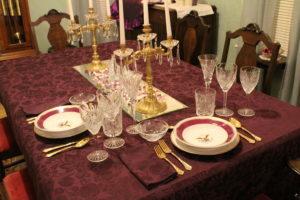 For my third table setting using the Lincoln China, I created a setting for two using my beloved Waterford Crystal in the Thanksgiving/Harvest pattern. Everything else remained the same. I love that crystal pattern; it has a wheat sheaf and they just sparkle. There is nothing in the world finer than Waterford Crystal, hand made in Ireland!